Check out this two minute video that shows how we manufacture our new chick and chicken feeder. 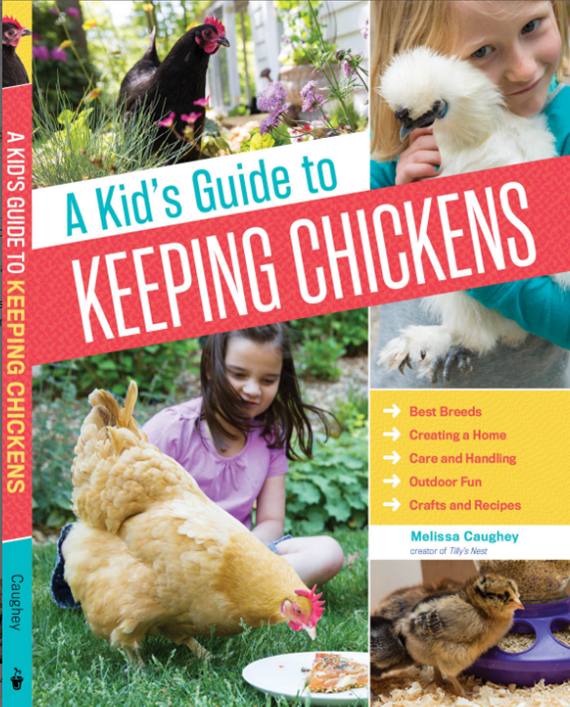 The threaded feeder tube is unique because it lets backyard chicken owners raise the shield the same way that a nut moves up a bolt. The shield prevents chicks from standing on the feed tray and pooping in their food. 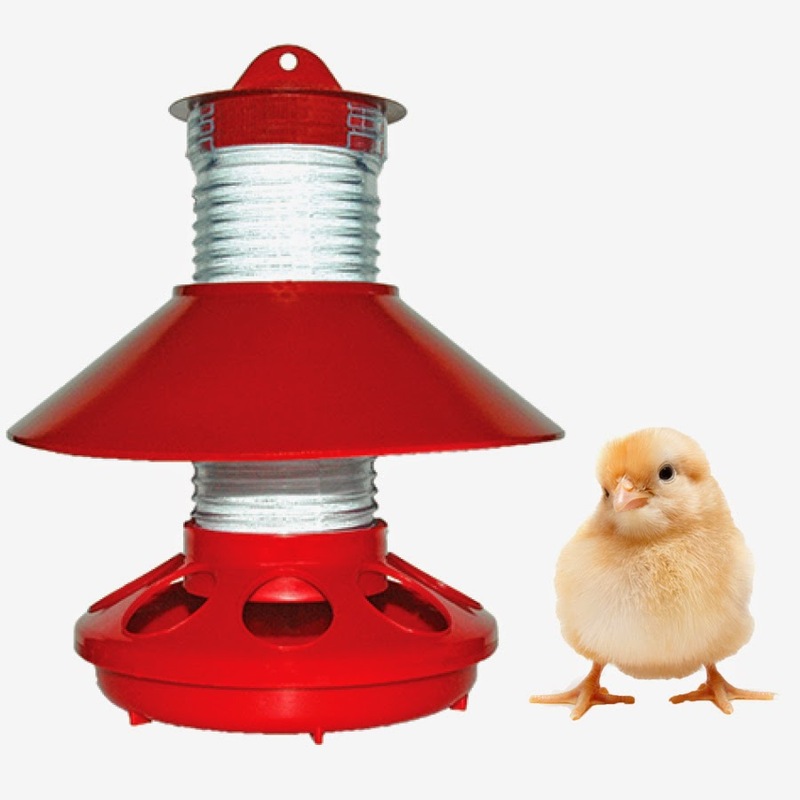 When the chicks grow up and leave the brooder, the shield prevents rain and snow from spoiling the food and is a perfect feeder for scratch, grit, mealworms and oyster shells. The mold used to make the feeder tube is complicated because of the size of the treads on the outside for the shield as well as those inside to accept the lid. A hydraulic device creates the the hollow core and then is removed when the plastic has set. Quick- 30 minutes max on nights when we need to get out of the house in a hurry. Nutritious - balanced one pot dishes that include a protein and a vegetable. Customizable - My kids just don't like eating the same things. We're always looking for a basic dish that can be customized so that everyone gets what they want. Homegrown - use fresh eggs from our chickens or veggies from our garden. Fresh Eggs From Our Chickens. Thanks ladies! The word frittata comes from the Italian word frigerre which means fried. It originally meant an egg fried in a skillet, but has come to mean a style of omellete that is cooked more slowly and served open faced. What makes a frittata especially nice is that any meat or vegetable ingredients can be added to the pan while the eggs are cooking. 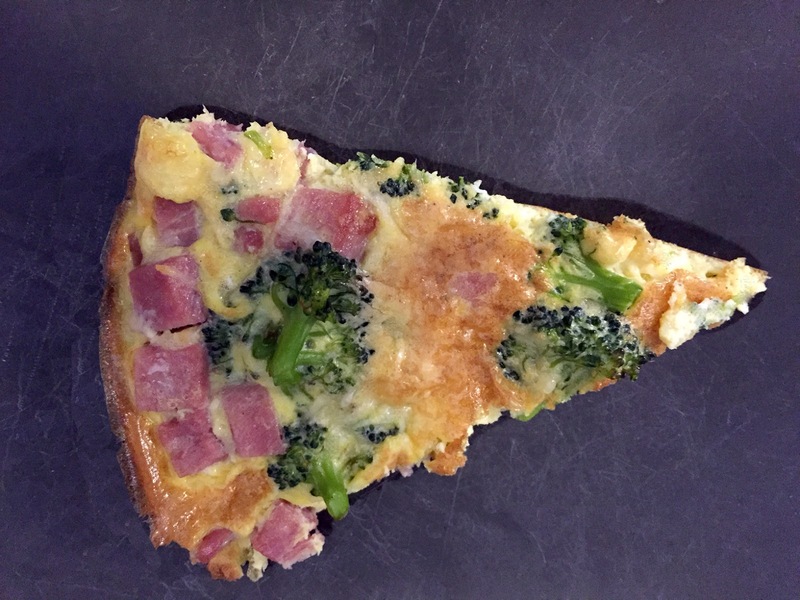 As a result, you can create sections of the frittata that appeal to distinct tastes. It's similar to ordering a pizza and having pepperoni on one half of the pie and mushrooms on the other. 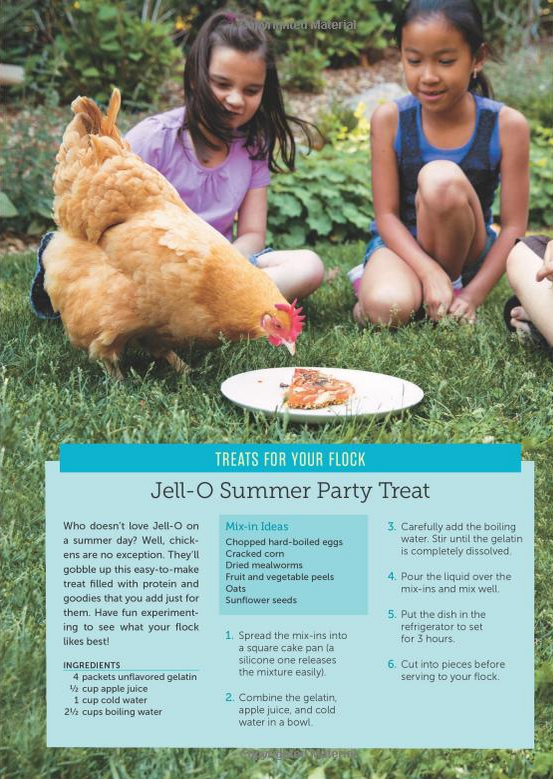 Importantly, you can use any ingredients you have on hand. 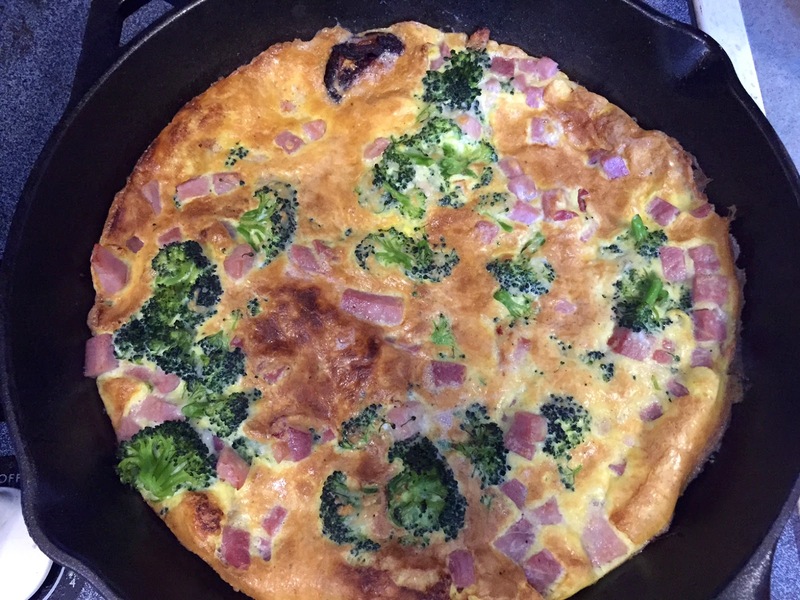 The frittata shown below was made using country ham and broccoli, but it could have just as easily been made with packaged sandwich ham, salami, or bacon, feta cheese, cooked leftover shrimp, spinach, or string beans etc. It's really whatever you like eating and have in your refrigerator. 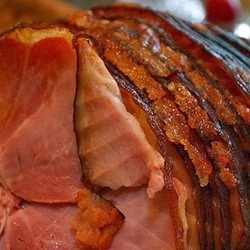 Your meat ingredient should be cooked in advance. If your vegetable ingredient is raw. Cook it quickly in the microwave while your getting the rest of the frittata together. At least one vegetable ingredient. Turn on your oven to broil and set the temperature to 400 F.
While the oven is heating get out your ingredients. If your vegetable ingredient is raw, roughly chop it and put cook in the microwave until tender but not overcooked. Add a few grinds of pepper and the grated parmesan cheese. Place a skillet that is sized so it can fit into your oven onto your stove top and bring it to medium temperature. When the pan is hot, coat the bottom and sides with the butter or oil. If everyone is eating the same frittata, put all the ingredients into the egg mixture and pour it into the pan. If you are customizing the frittata, pour the eggs into the pan and quickly add the ingredients in sections corresponding to whatever individual people want to eat. You need to do this quickly to pull off this trick. Cook for about 5 minutes on medium till the eggs are done on the bottom but runny on the top. Place the skillet into your oven and cook for another 3 or 4 minutes. 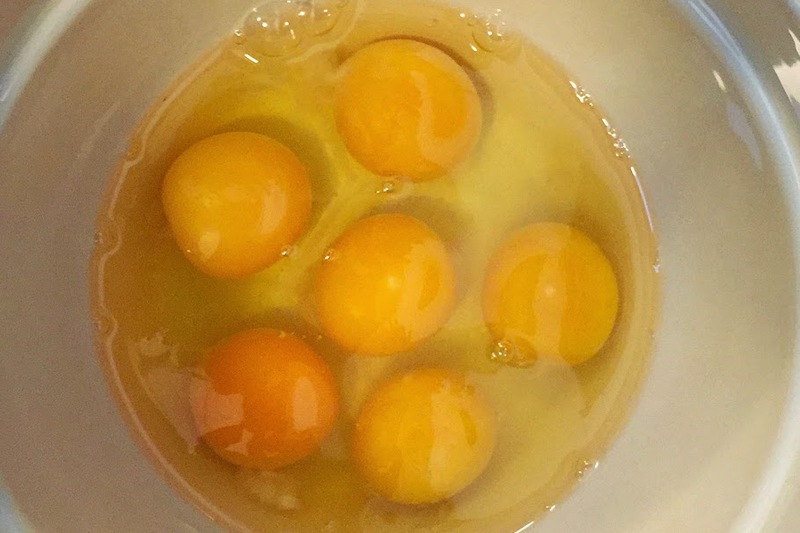 You want the eggs on top to be completely cooked and and have a light brown color.